Launched in 2005, Wales and West Utilities (WWU) has a regulated gas distribution business which includes approximately 35,000 kilometres of gas pipes across Wales and the south west of England. Covering a sixth of the UK, WWU takes care of 2.5 million gas supply points in homes and businesses in a catchment area with a population of 7.5 million people. WWU used three types of ‘traditional’ detection equipment; all of which involve pumping a sample from the potential leak source across a sensor/sensors commonly using catalytic or Flame Ionisation (FIM/FID) technology to detect flammable gases. WWU operatives predominantly use these portable devices to scan an area for escaping gas by using a hand-held probe attached to the device. 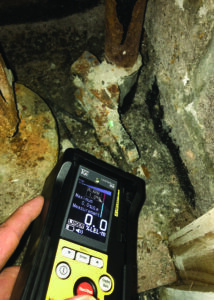 This method of leakage detection had dominated the UK market for decades and although effective, had limitations as the operative was unable to visually observe the leak so could not survey from a safe distance. The readings are measured in three categories – Parts per Million (ppm), Percentage Gas in Air (% GIA) and Percentage Lower Explosive Limit (% LEL) which (for methane) can be converted to 50,000 PPM = 100% LEL = 5% GIA when in proximity of a leak. Although this was an effective method of detection, the detection probe needed to be operated at arm’s length which meant the operative needs must be close to the leak source which can present problems when looking for leaks which are out of arms reach, above rivers or train tracks or in locked/enclosed environments. There was also a delay in the device readings. WWU wanted to observe different technologies in action and understand how they could deliver the best new technology to support existing methods and so decided to conduct a trial. understand their respective capabilities and whether these products could improve efficiencies in surveying (including saving time and increasing safety). In January 2017 WWU invited Crowcon Detection Instruments to take part in the trial which showcased three different technologies. WWU carried out seven scenario surveys to detect leakage and monitor quality. The scope of trial was to test the three products in different scenarios to gain an understanding of the products strengths, weakness and how each performs against the existing devices. This helped WWU identify individual capabilities and how they could achieve ‘increased timesaving and safety’. Leaks on 7 Bar pipelines can be difficult to detect as much of the High-Pressure Network (HP) is buried ≥ 1.1m deep as they are mainly situated in fields. They must therefore be deeper than 1.1m to avoid farmers’ plant. Before the gas becomes odorised it can be more difficult to detect a leak as operatives cannot rely on their senses to alert themselves to leaks. In addition, there are many small fittings within the station, so surveys can take longer (depending on the size of the station). Large pressure vessels can take a long time to survey with a handheld probe and operatives need to be at close range. clude minimising the time taken to find leakages, the use of bar holes (which can cause defects and incur costs) and potential damage to other underground utilities such as electric cables. Pipelines commonly run under roads and pavements, resulting in road closures and in this instance, there must be a safety consideration and again additional costs can be incurred. Additionally, the use of hand probes requires the operative to be near potential emissions. River or railway line crossings can have pipelines crossing them. The challenge associated with this scenario is that these areas are difficult to access leading to the requirement for specialist equipment and resources. Flight surveys are currently conducted by helicopter. The operative will survey the local transmission system fortnightly. These flight surveillance activities confirm there is no construction or encroachment on high-pressure pipelines. Also, to utilise drone technologies for ‘difficult to survey’ assets such as those crossing estuaries. The trial results demonstrated there would be benefits to implementing this new technology and out of the three products on trial, the LMm’s capabilities provided the best overall fit for WWU’s requirements. 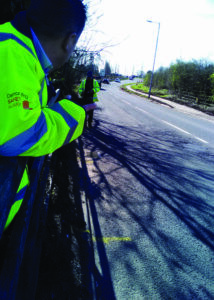 LMm demonstrated it was easy to use and be of most use on the WWU network for MOB and Special Crossing surveys where it could increase safety by detecting a leak from a safe distance. In addition, the LMm is highly sensitive and selective to methane and could be utilised where suspect gases (swamp gases or insulation board emissions) are discovered. Crowcon’s LMm provided a commercially beneficial option over WWU’s current practice of employing specialist consultants and it plans to now carry out this activity in house using the LMm equipment. LMm is a compact handheld detector which specialises in the detection of methane gas at a safe distance (0-100m). 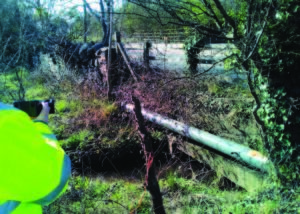 Utilising laser technology, methane leaks are located by pointing the laser beam towards the suspected leak, or along the survey line. The technology aims to remove the need to access elevated places, potentially reducing costs and improving the speed of leak detection activities. LMm is aimed at industrial, commercial and research environments or anywhere that methane could be present and in need of locating or monitoring. LMm is easy to operate and requires no maintenance. An automatic self check during start-up ensures consistent performance and reliability every time units are turned on. The green laser guide light is highly visible, even under strong sunlight which means it simplifies the location of leaks. A Bluetooth option is also available which allows the device to communicate gas levels, time and date to the GasViewer app, which combines these data points with position information from the android smart device. conduct detection on driving or flight surveys (laser and camera only).